While I spend most of my work day designing and delivering keynote addresses and workshops, I’m an avid woodworker in my spare time. I’ve always limped along using a workbench cobbled together with scrap wood and old kitchen cabinets. This spring, I decided it was high time to build a ‘proper’ woodworking bench. I turned to the internet for inspiration and construction ideas. There, I discovered hundreds of blogs and articles full of thousands of photos of really great ideas. I slowly started collecting ideas and fantasizing about my future workbench. What type of wood would I use? Maple is beautiful and heavy, but it’s expensive. Pine is cheap, but not as durable. Did I want the vice on the left or right side? What kind of vice would be best? What kind of joinery would I employ? The decisions that I had to make piled up like so many 2x4s in the lumber yard. It didn’t take long for a sense of anxiety and overwhelm to settle deep in my chest. So I narrowed my choices down to 3 options. After a few minutes of consideration, I settled on a simple design and got to work. Making a choice from 3 options was WAY less stressful than trying to choose between, well… everything on the internet. I had spent months, riddled with anxiety, hemming and hawing over every detail. 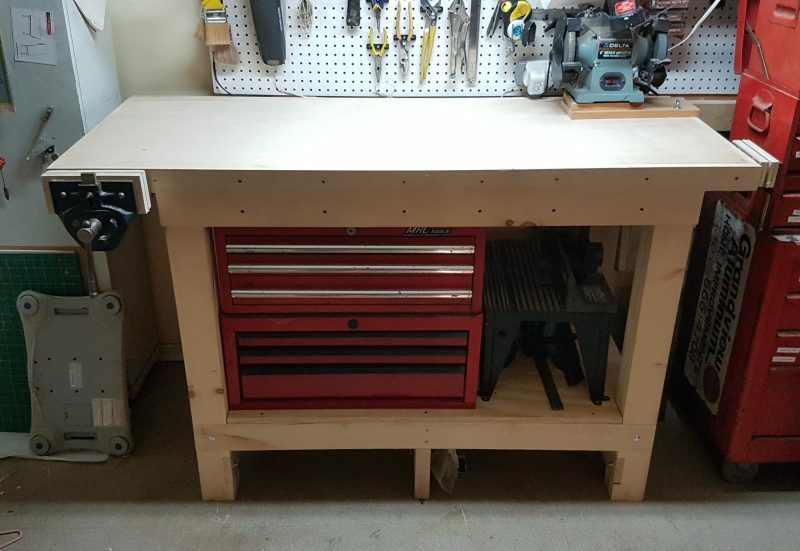 Once I actually began construction, it only took me a weekend to complete a super solid workbench that will last me for years to come. Logic suggests that if we have the power to choose whatever our hearts desire, then we’ll be happy. Strangely, it’s not the case. “As the number of options increases, the costs, in time and effort, of gathering the information needed to make a good choice also increase,” he writes. Have you ever experienced that? I sure did with my workbench. Too many choices paralyze us, and can lead to increased anxiety and even depression. 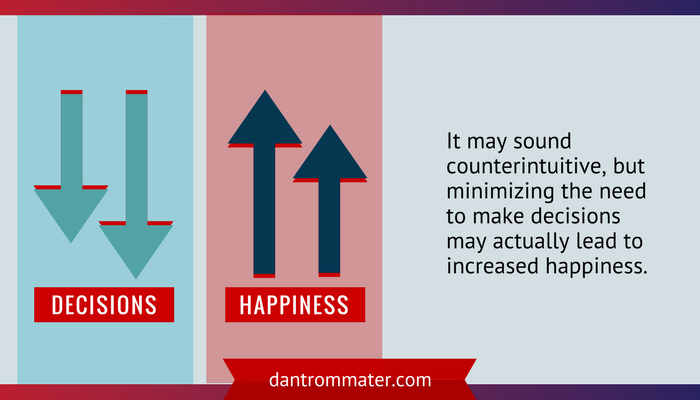 It may sounds counterintuitive, but minimizing the need to make decisions may actually lead to increased happiness. A growing number of researchers are trying to explain how choice overload and constant decision-making are negatively affecting us. It starts the second our alarms go off in the morning. First, we choose whether to snooze the alarm or get up. Then, we choose what clothes to wear. What to eat for breakfast. What route to use to get to work. Let’s say we stop at a coffee shop before work. Where 20 years ago, we would just have a coffee, today we must choose between dozens of different beverages (Double Coconut Mocha Frappuccino anyone?). Should we answer that email from our boss now or later? How should we answer it? What clients must we reach out to? How should we reach out to them? Phone, email, text, Facebook message, Tweet, Instragram message? You get the point: the decisions go on and on and on. All this decision making burns us out. By the time we leave the office, decision fatigue has reared its ugly head and we don’t want to make another choice. Psychologist Roy F. Bauermeister, explains decision fatigue as the price paid for making decisions all day. The more decisions we make, the more prone we are to making bad decisions (or avoiding decisions altogether). This is because we have a limited amount of mental resources that we can use, and constantly making choices uses up that capacity very quickly. Each decision you make works your decision muscle until it’s so tired it doesn’t work anymore. This is why after making decisions all day, all we want to do is sit in front of the TV (with a bag of chips) and shut our brains off for the rest of the night. How Does This Affect Our Decision Making Abilities? Bauermeister’s research found that the more choices we make in a day, the worse those choices are. This concept was brilliantly proven by Jonathan Levav and Shai Danziger. These researchers used Israel’s legal system to show the impact of decision fatigue. In a paper published in 2010, the researchers analyzed 1,100 cases in which prisoners went before a judge to seek parole. …Getting parole had nothing to do with the crime the prisoners had committed, the length of their sentence, or their ethnicity! The biggest factor that determined if parole was granted was the time of day the prisoners went before the judge. The prisoners who appeared earlier in the day were more likely to be paroled than those who went in the afternoon! Were judges making these decision on purpose? They were experiencing decision fatigue. By late afternoon, the judges had already spent most of the day making tough decisions. This led them to take a common shortcut. Instead of agonizing over the decision and its implications, they opted for the easy way out, upholding the status quo and leaving the prisoner locked up. 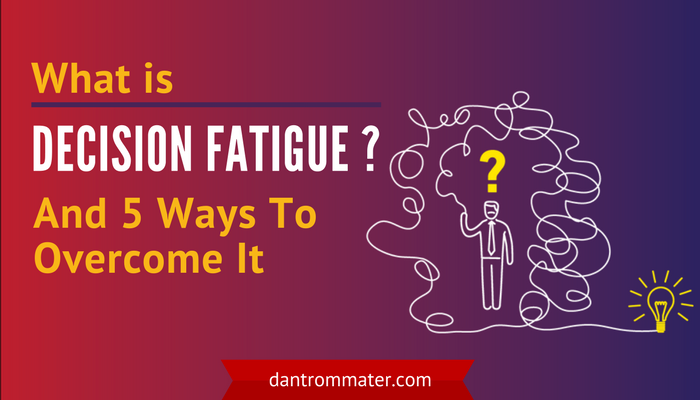 So How Do We Avoid Decision Fatigue? If you want to make better decisions, especially at the end of the day, here are five things you can do reduce the amount of decisions you make every day. 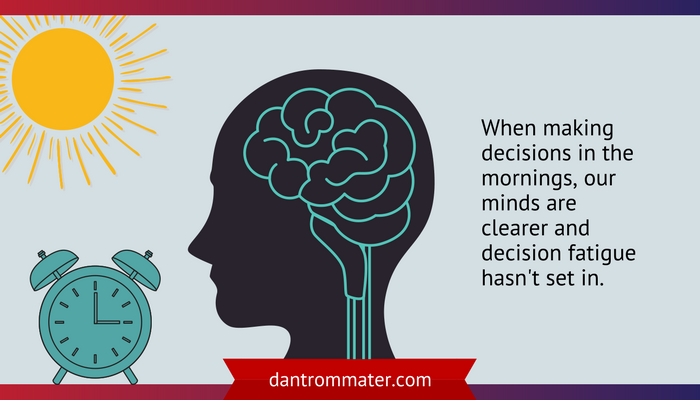 In the mornings, our mind are clearer and decision fatigue hasn’t set in. To get this done, prioritizing is important. That’s why one of the first things you do every morning (or the night before!) should be to make a list of important tasks that you need to finish, and prioritze them. That way, you get the most important things done while your mind is still fresh. 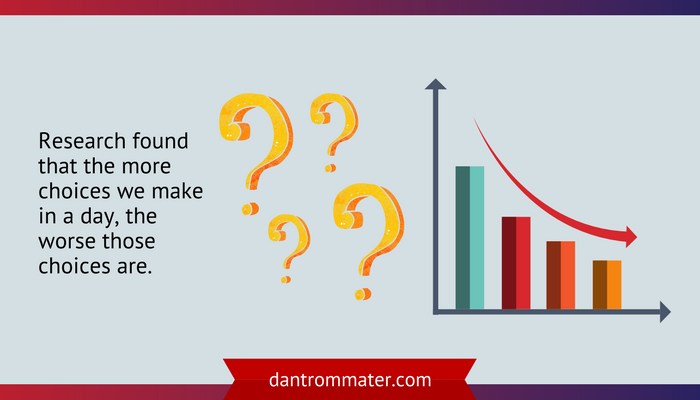 Limiting your options is a great way to avoid decision fatigue. This goes for everything: from what coffee you get in the morning to what clothes you wear, or how you tackle projects. Leaders Steve Jobs and Mark Zuckerberg are famous for limiting their wardrobe, choosing the same outfits everyday. This allowed them to make less decisions every morning. Following routines and minimizing options helps you avoid agonizing over decisions. Studies show that multitasking can decrease productivity by 40%. One of the reasons for this is that multitasking requires constant decision making. Should you open that Facebook notification now or ignore it? Should you answer the text message you just got or go back to writing that email? As silly as that sounds, making those decisions contribute to decision fatigue. I suggest you disable social media and news notifications on your phone (or leave your cellphone in your bag). By avoiding those distractions you cut back the amount of decisions you need to make. This will allow you to be more productive and keep your mind sharp for more important decisions. I learned this when I started writing my blog. Getting the first draft done (however bad it is) is extremely important. If you’re constantly fussing over word choice, you’ll most likely end up getting decision fatigue. You’ll get fed up and start procrastinating. Your first task is to get things done and to a place where you feel like it’s good enough. Then, if you have time, you can revisit it and make small changes to improve it. Fear of Missing Out, or FOMO, is something we’ve all struggled with. We say yes to things that we don’t need (or want!) to do, because we are scared of being left out of the loop. 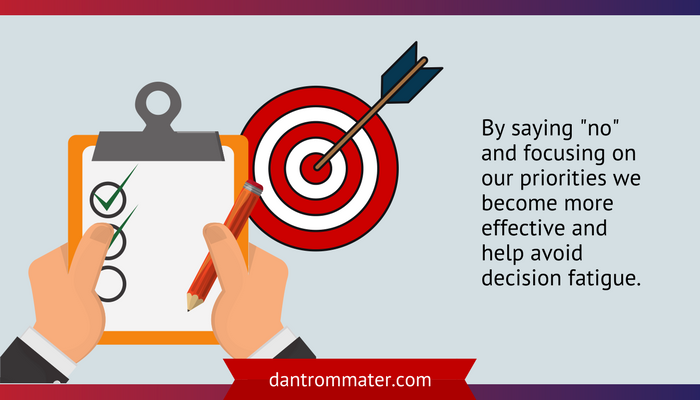 By saying “no” and focusing on our priorities we become more effective and help avoid decision fatigue. Make a list of all the types of things you want to say no to. Then follow your list. We live in a complicated world. Today, coffee shops have 40 items on their menus and electronic devices are constantly fighting to capture our attentions. Simplifying your life helps reduce the amount of decisions you make on a daily basis. This will lower your stress, and make you happier. Take control of the things you can, and you will soon see a difference in your life. Make sure you check out 5 Powerful Positive Psychology Hacks To Transform Your Team for some great techniques that you can use. CostCo knows all about Decision Fatigue. They consciously limit the variety of items offered to make it easy for shoppers to make a decision. Great point Michael. Thanks for sharing! Great article Dan. I remember from Daniel Kahneman’s ‘Thinking, Fast and Slow’ that glucose depletion takes place when cognitive work is done, and if I remember correctly, more so when it requires slow, deliberate thinking. Your point on ‘Done is better than perfect’ is a right on too. Sometimes we block ourselves and don’t know we’re doing it. Thanks for sharing!